SPS5. Obtain, evaluate, and communicate information to compare and contrast the phases of matter as they relate to atomic and molecular motion. a. Ask questions to compare and contrast models depicting the particle arrangement and motion in solids, liquids, gases, and plasmas. a. Develop and use models to explain the properties (solute/solvent, conductivity, and concentration) of solutions. b. Plan and carry out investigations to determine how temperature, surface area, and agitation affect the rate solutes dissolve in a specific solvent. c. Analyze and interpret data from a solubility curve to determine the effect of temperature on solubility. d. Obtain and communicate information to explain the relationship between the structure and properties (e.g., pH, and color change in the presence of an indicator) of acids and bases. (Clarification statement: Limited to only the structure of simple acids and bases (e.g., HCl and NaOH) that demonstrates the presence of an H+ or OH-. e. Plan and carry out investigations to detect patterns in order to classify common household substances as acidic, basic, or neutral. SPS7. Obtain, evaluate, and communicate information to explain transformations and flow of energy within a system. b. Plan and carry out investigations to describe how molecular motion relates to thermal energy changes in terms of conduction, convection, and radiation. c. Analyze and interpret specific heat data to justify the selection of a material for a practical application (e.g., insulators and cooking vessels). d. Analyze and interpret data to explain the flow of energy during phase changes using heating/cooling curves. EQ1: How is matter classified? EQ2: What is the difference between an element, compound, and mixture? EQ3: How are mass and volume related to density? EQ4: How does the arrangement and energy of particles determine the phases of matter? EQ5: How do you interpret a phase change diagram and phase change graph? EQ6: How can temperature, pressure, and volume be used to determine the behavior of gases? EQ7: How do changes in pressure, volume, or temperature of a gas relate to each other? 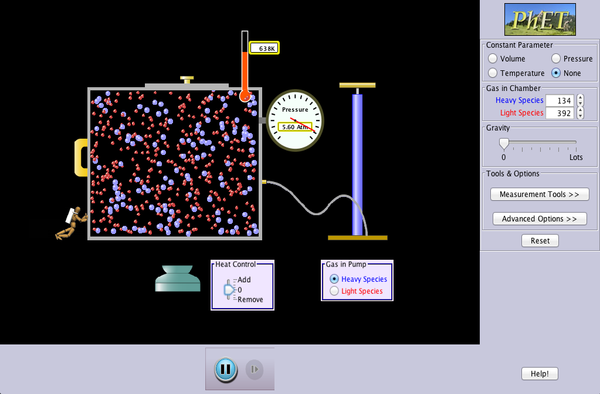 Click here for an interactive quiz on gas laws!